...GET IT SHIPPED Free Auto Shipping Quote: 1973 Jeep CJ5 new seat, shocks, battery, fuel pump, body lift, body wrap, n floor. ...Seller's Vehicle Description 1973 Jeep CJ5 newseat, shocks, battery, fuel pump, body lift, body wrap,n floor. 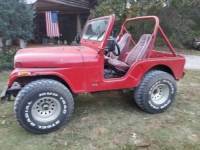 ...Seller's Vehicle Description 1973 Jeep CJ5 Clean, 6 banger manual just a good old Jeep nice paint rust free tub has. Half cab with it.